These days this hut gets a steady trickle of visitors. Certainly more than 1975 when Duncan Hamilton, myself & a few friends seemed to be the main people that visited the place. A fair percentage of users fly in but it is only a days walk to get there from the Kakapotahi or Mikonui roadends. Visitors are mainly trampers or hunters. There are some great alpine routes that can be done from this hut and you regularly see chamois when on the tops above the hut. I don't remember weka in the area back in 1975 but they have recolonised it and there seems to be a family of them living under the hut now. They'll come inside if you leave the door open. glennj I noticed 7 powelliphanta snail shells not too far from this hut. 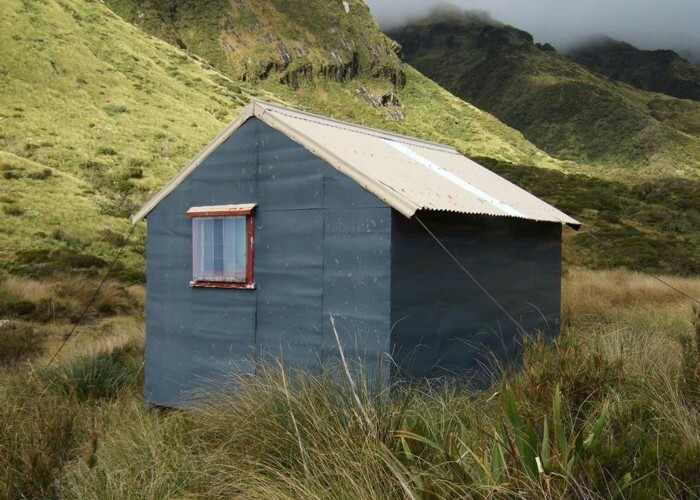 3 were on Dickie Ridge & another 3 were on the spur past the hut heading up to Mt Beaumont. These 6 were all up in the tussock & looked to be the same species. Over in Prices I saw one other powelli. shell that was smaller, paler in colour & of different form. It was lower down in the scrub tussock transition zone and was almost certainly a different species to the other 6. I didn't see any live ones but wasn't looking for them. Added 10 April 2012 by glennjglennj. 1 revision 26 April 2012 by glennjglennj. 69 views in the past year (6 per month).